While the wintry weather is an inconvenience for some, for the Kansas City Streetcar, the recent snowfall is a welcomed obstacle. "We will be paying attention to how the vehicle operates in the snow, what the visibility is like, how the brakes work in conditions like that," said Donna Mandelbaum with Kansas City Streetcar Authority. "It is all part of the testing process that we have to do for each vehicle." The only time the streetcar won't chug along is when weather conditions are too dangerous, for example during a blizzard or tornado. The tracks lie flush with the road, so snow plows can easily remove the ice and snow that get in the way. "With the streetcar operating at most hours of the day, the constant movement on the track will help eliminate snow buildup," Mandelbaum explained. One issue that could possibly arise, especially during the winter, is snow covering the thin white line that separates the streetcar's jurisdiction from public parking. 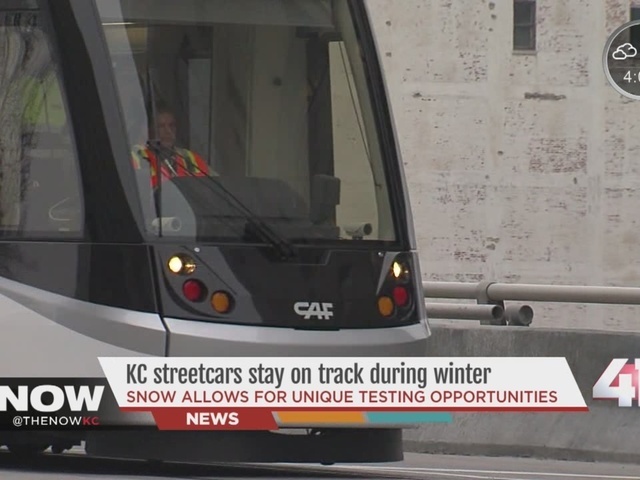 That's something the KC Streetcar Authority told 41 Action News they will work on during the testing phase, which takes place between now and spring. "If we do come up to a vehicle parked on the side that is blocking us, we will have to stop and make sure the vehicle is removed," she said. And by removed, she means towed, so be sure to make sure your tires and side mirrors are tucked inside the white box before leaving your car.